Perfect Privacy has been operating since 2008. That’s ancient in tech age. What has become of their VPN service since then? Well, we can share that they provide unlimited simultaneous connections, no logs and some bold new features you may have not seen before. Perfect Privacy VPN is a Swiss-based service that launched in 2008. Like its name, they aim to give their user base a perfect privacy solution for browsing the Internet. Perfect Privacy is infamous for its high subscription costs, but this shouldn’t be an issue if everything worked as intended. We will find out in this review if the price is worth it. This is the kind of feature that we give kudos for, despite a low server count (see the cons section). Perfect Privacy is all about protecting your privacy and staying anonymous. And obfuscated servers, or “Stealth VPN” as Perfect Privacy would like to call it, is the solution. There are some countries like China that does not allow VPN services on their networks. Stealth VPN basically masks your VPN as normal traffic. Your ISP won’t know you’re connected to a VPN service with this feature. This allows for more users to bypass government censorship and regional restrictions. Torrenting Policy: Configurable port-forwarding. It’s time to get your torrent on! Perfect Privacy claims to be the best VPN for torrents and P2P downloads (we respectfully disagree – these are our best VPNs for torrenting). This is actually not far from reality since they have port-forwarding configurations for torrent clients. You can even torrent on mobile devices. The only problem is that the speeds might be a limiting factor for some people. Should you be willing to pay the price for Perfect Privacy VPN, you can do so through a lot of payment options. As a customer, you can pay with PayPal, MasterCard, Visa, UnionPay, MOBIAMO or even Bitcoin. There is even a possibility to pay in cash, this is considered as the most anonymous method, albeit the slowest one. The address that you need to send your envelope to is provided on their website, and once your payment is delivered, your account will be activated. When we look at the menu of Perfect Privacy, we appreciate the information we can get at a glance. The server selection shows the bandwidth usage of each server, this enables you to search for a less congested location. In order to connect to the server of your choice, you should just click the plug icon on the right. The settings menu is also quite rich with options and configurations. More advanced techies can fully take advantage of these settings. We particularly liked the manual override for selecting a DNS server. It can be very helpful for advanced users in case their VPN connection isn’t stable. Users who do not understand these settings should stay away from the configuration options as it could potentially be difficult to troubleshoot in the long run. Based on Google’s TensorFlow, an open-source library for machine learning, NeuroRouting analyzes Perfect Privacy servers’ routing and optimizes your network route. This feature keeps your traffic within the Perfect Privacy network as long as it can or until it reaches the final destination – the website you’re attempting to access. In the best case scenario, your traffic is kept internal and not exposed to the Internet at all. It’s an interesting concept indeed. Perfect Privacy claims that they do not log any of your data. VPN servers that keep logs compromises your privacy and security which defeats its own purpose. We like the idea that Perfect Privacy offers IPv6 support, not all VPN providers offer this service. Perfect privacy is fully integrated with IPv6 which means you don’t have to worry about potential leaks. Likewise, there are also no reported leaks with IPv4 and DNS. This is a great sign for privacy and security as it mitigates the chance of you getting exposed. Security-wise, Perfect Privacy has it covered. Perfect Privacy utilizes 256-Bit AES encryption which is the highest industry standard. The OpenVPN security protocol can be used, which makes your internet security much safer. Those using iOS devices would also appreciate the fact that there is a proper IPSec security protocol integration. This takes away the need for use of a third-party OpenVPN app to integrate with Apple devices. Perfect Privacy has been equipped with a kill switch. This means that your connection will automatically shut down when the VPN detects a leak. This is a great feature to have as an additional security measure, especially for unstable internet connections as your chance of being exposed will be dramatically reduced. Perfect Privacy offers a 7-day money-back guarantee. This is quite a short amount of time considering other VPNs may offer 30 days without the need of a credit card. If you’re one of the users who opted for a cash payment option, the refund might be a little complicated to do. Perfect privacy covers all the basics: Windows, Linux, Mac OS, iOS, and Android. We hoped to see more native options for gaming consoles and smart TVs due to their price point. However, Perfect Privacy just left us disappointed with such high promise. Perfect Privacy allows for unlimited simultaneous connections but this is hard to take advantage of when you might not have compatible devices. Should you wish to connect the “incompatible” devices, you would have to configure a router for VPN use or buy one that’s pre-configured. When signing up for Perfect Privacy, you will first choose your subscription plan from their list. 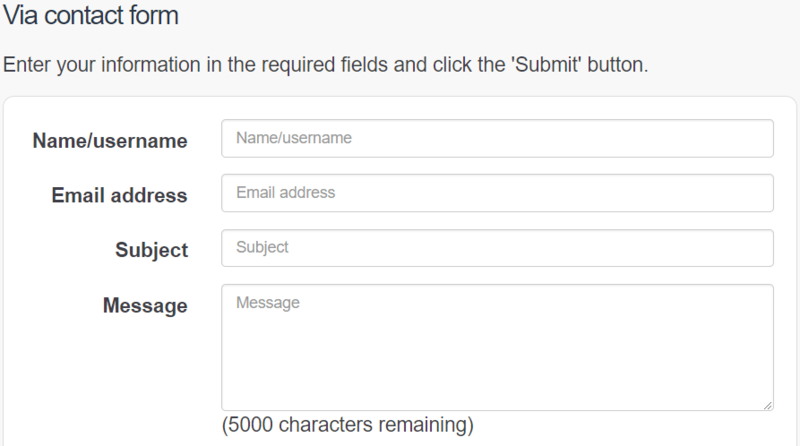 This is followed by account creation where you are asked to create a username and input a valid email address. 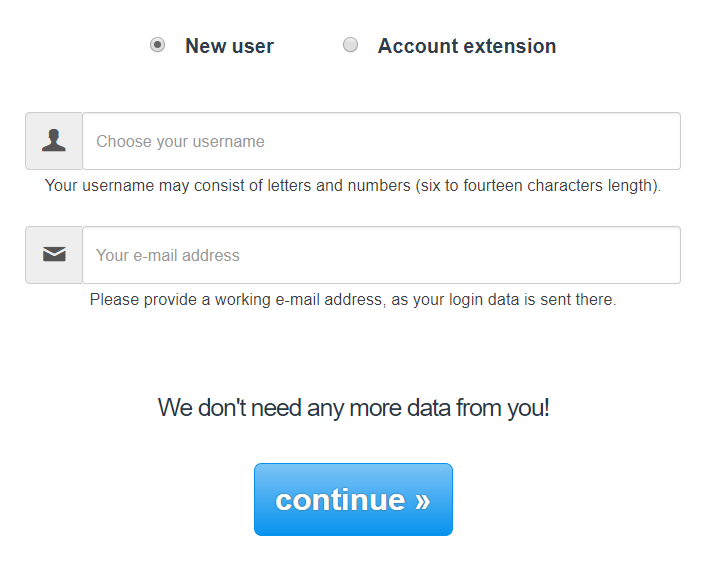 If you’re concerned about privacy, you can just create a new email address dedicated to your VPN. The last step is selecting your payment option and completing the payment of your choosing. Like all VPN providers, Perfect Privacy has an FAQ board which has answers to the most basic questions. But what separates Perfect Privacy is that they have a forum where users and some of their employees can have open discussions. This is support method is very cool since the staff can engage the community. 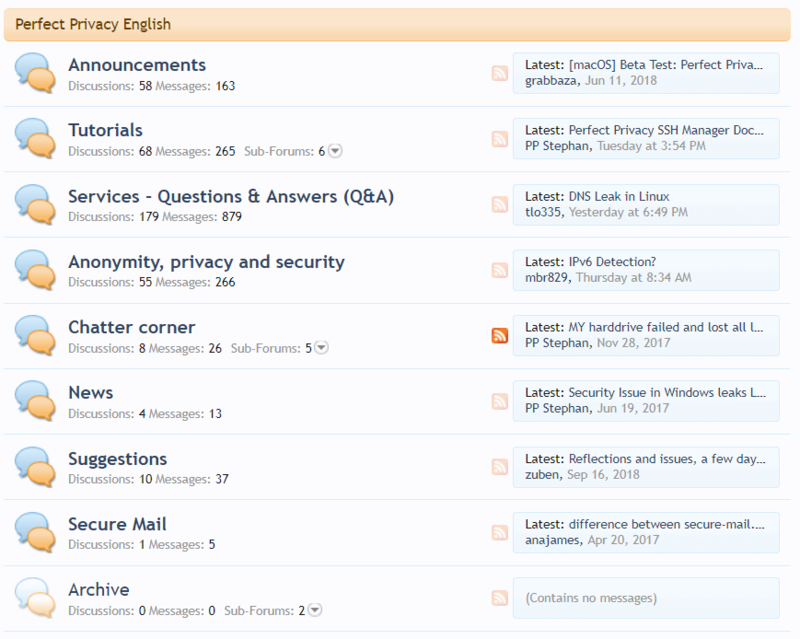 Customers are also able to search the forum for answers since there could’ve been another user with the same issue. A dedicated forum is quite rare to stumble upon nowadays. Perfect Privacy is a VPN that has about 55 servers in 23 countries around the globe. In theory, the more people who share the same IP, the more anonymous you become. Strength in numbers. We do have to remember though, more people sharing the server means the hardware resources must be shared between more people as well. There aren’t many competitors around this price point. And most of them have servers in the thousands. Anyway, this VPN has focused on providing servers in some uncommon locations like Hong Kong, Egypt, and Iceland. However, Perfect Privacy’s server network is not properly distributed. For instance, this VPN doesn’t provide a server in South America. The main problem encountered by VPN services that have a small number of servers is providing fast speeds. Having a small number of servers means that more users are sharing a single connection. Even more so, a fewer number of server locations means that your choices are limited. You may have to connect to servers that are not geographically close to you. This means that your data has to hop through multiple servers before reaching your VPN’s, effectively slowing down your connection. Perfect Privacy has fallen victim to this, and we observed high ping and throttled speeds (up to 40%). Perhaps there was a hiccup during our test? Perfect Privacy uses state-of-the-art gigabit servers with full IPv6 support. We will definitely conduct a new test soon. Most websites don’t really care if you use a VPN or not, they wouldn’t even bother checking. Netflix is serious when it comes to this topic. Once they figure out that a certain IP address belongs to a VPN server, their system automatically flags the address. VPN providers like Perfect Privacy are more easily locked since they have fewer servers for Netflix to identify, whereas Express VPN has thousands of servers and a long list of Netflix-dedicated servers. If you need a VPN to access Netflix, Perfect Privacy isn’t the best bet for you. The best VPNs for Netflix access are right here. Pricing & Plans: What’s the value of privacy? The cheapest rate you could get for Perfect Privacy is priced at 8.95 EUR, or around $10 a month. That’s if you can commit to a 2-year plan. Otherwise, the costs are going to start adding up quick. Even the best-rated VPNs don’t even charge this much. We’re unsure why Perfect Privacy has their rates pegged at such a high price point; perhaps it’s a premium for your privacy? Whatever it is, they’re reaching a bit hard. Although many would happily pay the price if their privacy was 100% guaranteed. For the price point of Perfect Privacy, you’d expect a 24/7 live chat option. We were once again left disappointed as they only offer ticket support. The response we got from their end was quite acceptable and useful. The ticket was responded to by their customer service reps in just a few hours. It’s far from a live chat experience, but at least there was support from their end. Founded in 2008, Swiss-based Perfect Privacy focused their efforts on creating a perfect personal VPN solution. They have also ventured in providing VPN services for corporate and enterprise solutions as well, although we’re not too sure about their clientele. Perfect Privacy fills the need for security against industrial espionage. With multi-hop connections up to 4 servers without extra charge, Perfect Privacy shows excellent promise on the privacy-side. Normally, VPN services offer multi-hops with two servers. Perfect Privacy does with four! Now we know they’re taking privacy and anonymity seriously. In fact, two of their servers were seized in Rotterdam, Netherlands, and thanks to Perfect Privacy’s servers running on RAM discs, no customer information was compromised. None of the encrypted data was found due to this implementation. Switzerland isn’t a part of the 14-eyes alliance that shares intelligence among member states. But, the problem here is that Switzerland has its reputation for having data retention laws. In fact, they’re the most notorious in Europe. Despite Perfect Privacy VPN having no logs, there’s still no stopping the government from attempting to snoop on your online activity. If you are the type of user that values the highest level of privacy, you might need to consider another VPN service. But remember, Switzerland is Switzerland. The country has made a name for itself for being neutral in world politics. Perfect Privacy is not a bad VPN service per se. In fact, its security features are on par – or even better than some of the best VPN providers in the industry. In many cases that is what’s most important. The problem is that it doesn’t offer all the features that the average user wants. If you are someone with privacy in mind, the cost should be of no concern. Best to give the 7-day trial a run, and see if this VPN is for you. If you are looking for more features, you’re better off getting a VPN from this list.